Ross and Ohashi are both great examples of what is capable with good condition and overall great physical condition. The physical shape issues are so strange to see being an LSU fan. LSU has always had their girls ready to go and in great shape. That is part of the reason LSU always came out of the gate so hot and often peaked early. It wasn't so much about them peaking too early but they were just in peak shape to compete at their best right away and everyone else caught up as the season went on and they slowly got in better shape. UCLA had this issue for a number of years and it wasn't until last year that everyone got their act together and look what happened, they win a National title. I do know that during the off season the girls are on their own. Training, working out, eating habits, etc are all on them. This group of girls seems less motivated to keep up with everything during the off season. Not surprising that LSU has also had more injury issues. Hopefully they turn things around and DD and Jay get tough on these girls. There is still plenty of time to get in better shape and be a different team come post season. It will be hard, though. I also know for a fact that Ms. Val had issues with her previous teams staying in shape and she couldn't do much about it. She let them do themselves in and finally a group came along that was more self motivated and got the other girls on board. 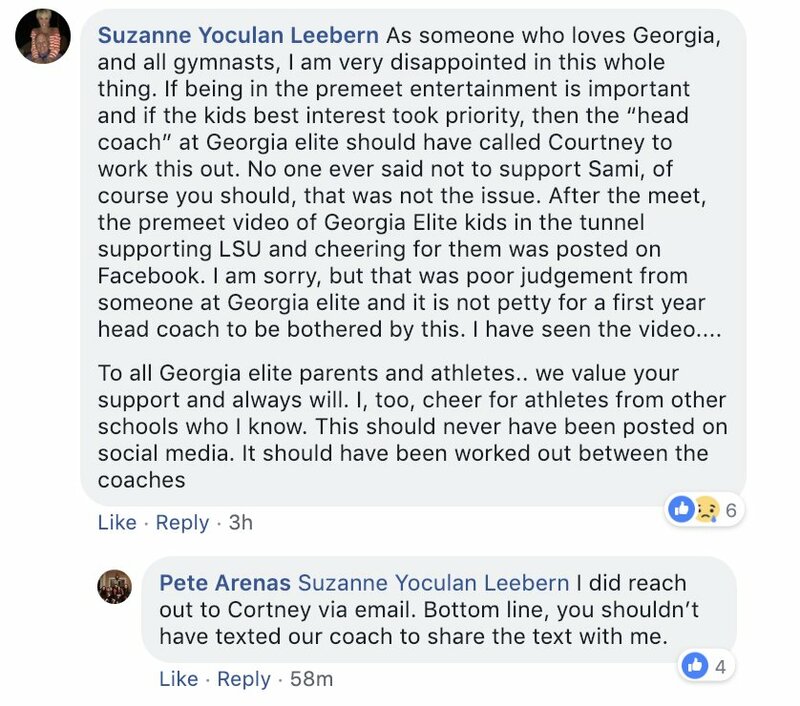 Mrs. Val was aggravated about it but her hands were tied and these gymnasts are adults. The NCAA rules mandate the number of hours he schools can have athletes under official practice. I believe it is 20 hour per week. The unsupervised aspects such as weight lifting and some conditioning is lef to the athletes, although subtle indicrect methods can be utilized to " encourage " more attention to these details as well as diet management. All but two of the gymnasts were on last year's team which did not have such issues. Was Mia a more influential leadrr than the current seniors? It may just be a series of injuries which have limited progress, but once they are healed a big move upward can occur. It may just be that paeaking later will be more beneficial as this seemed to work for other teams. We have gotten spoiled with 23-1 SEC records over the last three seasons. Sometimes its just not your night and hopefully we will begin so see some upper trajectory regardless of who wins this Friday. Kiya Johnson has the highest All Around score of any gymnast at level 10 after the first two weeks of competition with a 38.900. She won the all around title in the opening meet. I saw her compete in the Kurt Thomas invitational. She had a monster beam and floor routine. Competed a DTY on vault. Emma Kelley is off to a rough start for JO so far. She is back at Stars gymnastics. She had multiple falls on beam, bars and floor. Didn't seem like she had been training much. Kai Rivers had a rough start and appears to be battling an injury. She had a nice vault, only did a full. Had falls on bars and beam. Did not compete floor. Elena Arenas won the all around title in her opening meet in North Carolina. She had really good vault, strong bars and floor. Had a break on beam. Haleigh Bryant suffered some type of injury and did not compete at the Atlanta Crown invitations. She will not be going to Nastia Liukin cup this year as that was the qualifying meet. Tori Tatum competed on two events at the JO Gopher classic winning the bars title. Thanks for the Level 10 updates. Don’t give up on this LSU team just yet. Personally, I’m ok with the slow start. In years past, we always started so strong and seemed to somewhat fizzle out in the end and look flat going into post season. 2015 being a perfect example. As long as they continue to improve, which they did this past meet, I’m okay with it. i believe in this team!! I am curious, where do you think they improved in this last meet? Bars was great and we didn't count a fall on vault this time but really, that vault from week 1 was a fluke and we all know it. I just don't see the improvement, they looked worse - especially on beam. And with Kelley out on floor we saw exactly how little depth we have at the moment. I think tomorrow's meet is huge for them. They can show us that last week was an off week, maybe they were too affected by Kelley's injury. Or they can show us that they just aren't there yet. I don't think we need to win, I would just like to see 4 solid events and show they can or have the potential to hit 197. I agree with you. They did stand up vaults but two gymnasts on bars scored much lower than week 1 due to their inconsistencies,floor had many mistakes in landings and beam was not recognizable in comparison to week 1. Week two was far from the LSU quality we are accustom to seeing week after week. Let's hope for brighter days ahead. Anyone wanna make guesses for tomorrow’s lineups? No guesses from me but Rabalais’ article today had Kelley on vault and floor. The type of landings she is doing in the facility is very different from the one that is in the PMAC. I’d say there’s a lot to be happy about after last nights meet. It’s never nice to lose but the improvements were great and the best part is they still didn’t didn’t even hit close to their full potential. They can expect higher vault scores from basically everyone except Sarah f, bars was great, beam we expect higher scores from Sarah, and I’d say Christina and Sami too, and then floor was not even close to their best. Kennedi, McKenna, and Lexie can get much better scores and I believe Christina is in their ideal post season lineup there. Any thoughts? Floor will get better. I just don’t think Lexie was the right option Friday night. I agree that Desederio should be in the floor lineup, but she can be a bit inconsistent. Hopefully Kennedi can clean up her floor and vault. Bad bad look for Georgia. Suzanne is frickn insane. Sami and her mom must be thrilled to be far away from that crew. Sierra Ballard but up the highest beam score at the JO level this past weekend at the New Orleans jazz invitational!! You can then select individual events to see who's been putting up top scores on each event as a JO competition this year. And for those who think the scores are lower, JO is judged much differently than college. 9.7+ at the JO level is pretty much 9.9 type routines. How did the LSU recruits do at this past weekend’s invitationals? Also saw that Aleah and the GAGE girls are going to the January national team training camp but Olivia Dunne is not...is she injured or recovering from something? LSU ticket office may have the information on seating for LSU Fans. 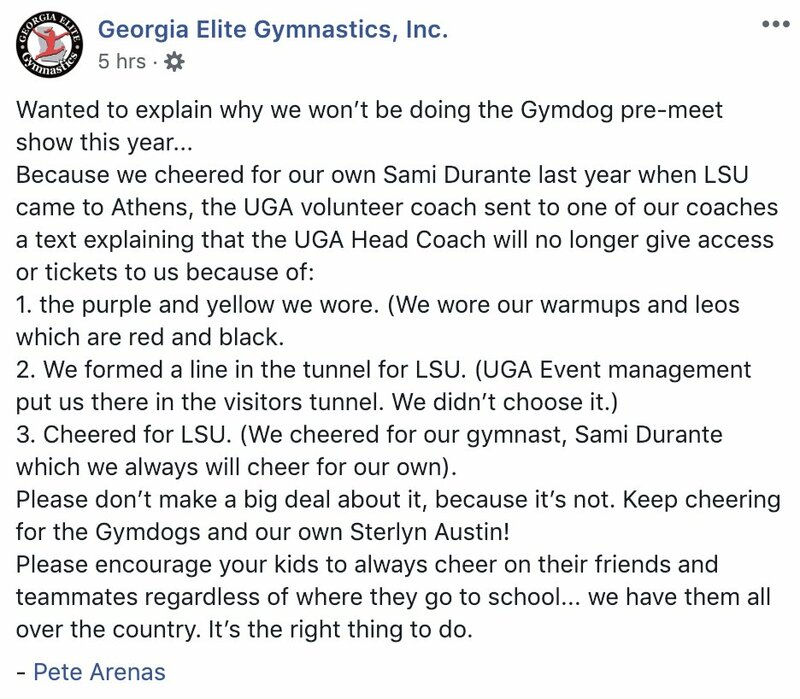 If not, maybe you can contact the Gymnastics Booster Club as some of the members always go to the SEC meets. Here is Ballard beam routine. Her improvement in all areas over these last two years has been outstanding, which is why offers have come pouring in at her. Kiya Johnson had another monster performance winning the all around with a 38.900, won vault, beam and floor titles, 2nd on bars. Elena Arenas won the all around again at Star Struck again in New Jersey. Won the vault title, finished 2nd on every other event. She had a phenomenal beam set. Her bars have been a little shaky the first couple meets but we all know what she can do on that event. Emma Kelley and Caitlin Smith have struggled. Emma competed in New Jersey as well. She fell on bars for the 2nd meet in a row. She has really struggled on every event not named vault. Caitlin competed in Nevada. Her floor was okay, not great but not horrible. Her beam was not good, she fell on her Onodi and on her series. She needs to get it together over these next 6 months before LSU. Bryant doesn't compete again until February 2nd at the Buckeye classic. She did not compete in the Atlanta crown invitation after sustaining an injury. Don't have word on the severity of it yet. LSU's most recent commit Kaytltyn Johnson has been really doing well at Texas Dreams, winning her all around. Her bars have improved drastically, she is very good on floor and vault. Working on a double twisting yurchenko. Beam will be fun to watch. TD knows how to develop beamers.